Growing up, Susan Dymecki loved biology, math and engineering. But from the time she donned skates at age 13, she was consumed by an entirely nonacademic passion: ice dancing. She competed nationally throughout high school, and after enrolling at the University of Pennsylvania, took a leave of absence to train and compete internationally. Dymecki then moved on to new challenges. At the time, scientists were just beginning to adopt revolutionary techniques for inserting or deleting specific sequences in the DNA of mice, creating ways to probe the functions of gene and cellular networks with unprecedented precision. Dymecki became a staff fellow in the Carnegie Institution of Washington’s Department of Embryology in Baltimore, where she established its first transgenic mouse facility and adapted a powerful gene manipulation tool from yeast called Flp-FRT for use in mammals. By applying this technique to switch the activity of genetically engineered reporter transgenes on or off in specific cells at specific times during in utero development, she was able to reveal the journey various cells take across space and time—and the genes involved—in the assembly of different brain areas. Rita Allen Foundation Scholar Susan Dymecki studies the functions of serotonergic neurons, which use the neurotransmitter serotonin to communicate. 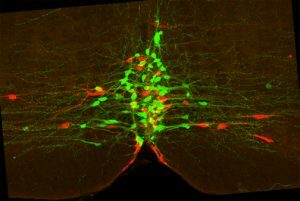 Here, two subtypes of serotonergic neurons with different functions (one marked green and one marked red) intermingle in the brainstem. 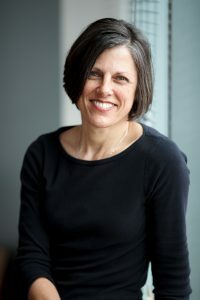 In 1998, Dymecki joined Harvard Medical School’s Department of Genetics as an assistant professor, and the following year she became a Rita Allen Foundation Scholar. Starting with Flp-FRT, her lab expanded its set of genetic tools and used them to map how different types of neurons in the brainstem—the region connecting the brain and the spinal cord—find their correct positions during development. In the past decade, Dymecki has continued her work on neural patterning in brain development. One major focus of her current work is on so-called serotonergic neurons, which use the neurotransmitter serotonin to communicate. Serotonergic circuits in the brain modulate a dizzying range of functions, from breathing, body temperature and heart rate to dimensions of mood and cognition. Dymecki’s lab uses transgenic tools and techniques to probe these neurons’ functions—for example, turning certain genes on or off during distinct periods of development or in specific brain regions or types of cells. Here, she reflects on her ice-dancing past, her love of serotonergic neurons, and the joys of collaboration. What made you decide to give up ice dancing and resume your education, and how did your years of athletic training influence your career? Returning to school was something I always knew I would do. What prompted the decision was that my dance partner needed to stop for personal reasons, and I was unable to find another partner with whom I felt I could progress. Another consideration was that my family was going through a challenging time. I was giving up a dream, but I had a strong sense that it was time to begin a new journey and ignite a new passion. I expected to chart an M.D.-centric course, with Ph.D. training on the side. But I fell in love with research: the pursuit of fundamental questions about how our cells, organs and bodies work; the aesthetic of the data; the heady experience of being the first—really the first—to observe something. I also loved the single-minded devotion of it all, much like training in figure skating. That feeling, so similar to the intensity I felt on the ice, helped me recognize that my heart lay in the laboratory and not in clinical medicine. What drew you to the serotonergic system? What’s so interesting about this particular neurotransmitter? In 2001, I learned from a colleague, Dr. Hannah Kinney, that dysfunction in this system seemed associated with sudden infant death syndrome (SIDS). I had just had my first child, and I couldn’t imagine anything more tragic than the sudden unexpected loss of an infant. How does one ever recover? I felt that if using our tools to better understand this neuronal system could help understand and eradicate SIDS deaths, I had a responsibility to pursue it. The more I delved into it, the more I became fascinated by the neurons that signal through serotonin, with their elaborate ramifications, innervating a wide range of brain regions to modulate specific physiological processes or behaviors. How does this neuronal system accomplish so many different tasks, affecting everything from mood and cognition to breathing, heart rate and body temperature? What we are learning is that there is a surprising heterogeneity in the types of serotonin neurons that exist in the brainstem raphe—a set of midline regions in the brainstem from which these neurons project. Differences in gene transcription over the course of development help to shape the suite of neurobiological tasks that each neuron will engage in. How have transgenic techniques changed neuroscience, and what do you predict they will continue to bring to the field? Studies of neuron electrophysiology, behavior, neuroanatomy and circuitry have all been greatly advanced through genetic techniques. By using genes expressed in cell type-restricted patterns, we can gain genetic access to subsets of neurons in a living animal and drive the expression of a wide range of molecules that label those specific types of neurons or regulate their biological activity. Then we can visually follow neurons as they develop—really watch axons and dendrites extend to their targets—which is the first step in mapping a neural circuit. We can use such effector molecules to turn a neuron’s activity up or down, and then study the behavioral or physiological consequences. We can also isolate types of neurons and discover the range of genes they express, as well as which of those genes enable unique functions. The possibilities are endless. My goal was to get in on the ground level and make a contribution that many could build upon.